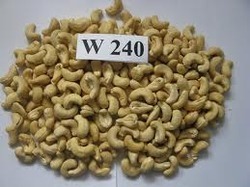 With immense industry expertise and know-how, we are actively engaged in manufacturing and supplying a huge gamut of W240 Cashew. These offered dry fruits are enormously appreciated and applauded for their crunchiness, buttery smooth texture with a pleasing and fruity aroma. Apart from this, we deliver these in hygienic packaging material to maintain their purity and freshness at our customers end. Incepted in the year 1991, Sri Siva Sankar Industries is a dynamic company affianced in manufacturing, exporting and supplying an incomparable array of Cashew Nut, Cashew Nut Shell Liquid, Raw and Parboiled Rice, Maize Corn, Biomass Fuel and Biomass Stove. The entire range of our products is processed and developed by making use of excellent quality ingredients that are procured from the certified vendors of the industry. All our offered products are highly required in the market and known amongst our patrons for some excellent attributes like supreme quality, long service life, durability and exceptional performance. Fabricated and designed in conformation with the industrial laid guidelines and norms, these products are widely used at various industrial and other allied sectors.